Swirskiline as is a product containing the predatory mite Amblyseius (Typhlodromips) swirskii Athias - Henriot Phytoseiidae, Acari, which originates from the Nile Delta of Egypt and adjacent areas of Israel and the Middle East. This mite is mainly used for control of whitefly, but will give some reduction in other small pest species. supplied in cardboard 1ltr tube bran/vermiculite. Amblyseius (Typhlodromips) swirskii is a small predatory mite which feeds on many types of small arthropod prey and pollen. It has been researched for many years as a predator of spider mites, Eriophyid mites and other pests on crops in Egypt and Israel, and was released into the United States in 1983 as part of a control programme for citrus pests. More recently, it was collected in Israel in association with whitefly, Bemisia tabaci, by researchers at the University of Amsterdam, and tested as a control agent for that pest. 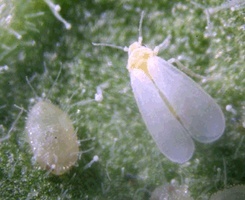 It was found to be able to reduce but not eradicate whitefly populations on cucumber plants to which pollen had been added. 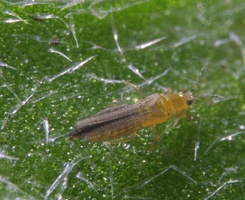 Researchers at PPO in the Netherlands have also studied this mite for control of whitefly and other pests, such as thrips. Adult female mites lay single eggs onto leaf hairs. The mites go through three immature stages, larva, protonymph, and deutonymph, before becoming adults. At 25°C, the entire cycle from egg to adult can take less than 7 days. All mobile stages are predatory. The mites feed by piercing small arthropod prey or grains of pollen with their mouthparts, and draining the contents.